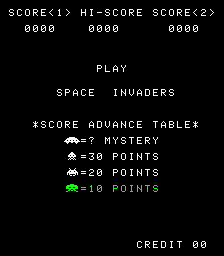 This is the first game in the Space Invaders series. For other games in the series see the Space Invaders category. The importance of Space Invaders to video game history cannot be overstated. While Pong introduced video games to the world, Space Invaders was the industry's first resounding worldwide success story. Space Invaders captured the imagination of thousands of players, as well as a ton of their quarters. At the same time, it captured the ire and negative attention of some concerned parents. Space Invaders first appeared in Japan, as the creation of arcade manufacturer Taito. Video games prior to Space Invaders served as a distant second to Japan's most popular past-time, pachinko, and did not appear to make any dent in pachinko earnings. When Space Invaders arrived, that was all about to change. Popularity for the arcade game sky rocketed and Japan was soon faced with a shortage of the yen coin needed to play the game. Almost over night, pachinko parlors cleared large amounts of floor space for the game. Note that when written in Japanese Katakana, the title of the game is actually "Space Invader" - singular, not plural. The reaction in the United States was not quite as drastic, but just as successful. Space Invader machines could be seen popping up in more locations than just the usual arcade halls. Hotels and grocery stores started setting them up to cash in on the phenomenon. 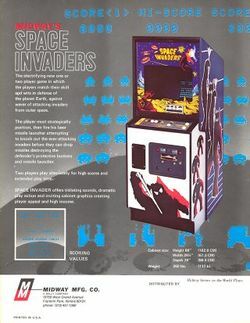 Compared to other arcade games of skill that were also available, Space Invaders provided players with a sense of urgency that immersed players into the game. Due to the surprising reaction to the popularity of the game, Atari decided they needed to have this game on their home systems. While Atari had brought many of their popular arcade games to the Atari 2600, they never considered another company's game. They made history by being the first company to ever license another company's game for home conversion. And it paid off. Making the official conversion Space Invaders available only on the Atari 2600 helped Atari sell more consoles than ever before. Since then, Space Invaders has often been seen as the icon for the birth of the industry, the start of Japanese success at game design, and the symbol for retrogamers across the world. Taito continues to published the game on modern day consoles, with remarkable accuracy. The legion of space invaders are attempting to take over the earth, but first they must establish a staging ground on the surface of the moon. Your mission is to prevent the moon from being taken. You must single handedly destroy each faction of the space invader army, and you must not let a single alien touch down on the moon's surface, or the humanity's future will be over. This page was last edited on 13 May 2014, at 08:20. This page has been accessed 50,427 times.